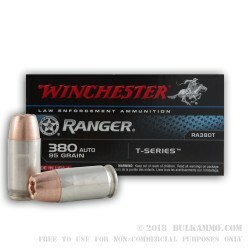 Keep your small pocket pistol properly muscled up with these .380 Auto rounds from Winchester. This ammo is manufactured under the specifications of the Ranger T lineup, lending it a few keen features to keep you ahead of the game when your training counts and your life is on the line. Each cartridge is built using a reloadable brass casing wearing a light coat of nickel which not only promotes smooths cycling and extraction but repels humidity from a holstered environment; this protects the rounds from deterioration so that they are ready to go if need be. Each case has a non-corrosive Boxer primer installed at its base and clean-burning propellant within its housing. Winchester uses their own powders and primers for dependable ignition and picture-perfect pairing that results in controllable recoil with no loss of terminal effect. Speaking of terminal ballistics, the projectile of this .380 ACP load comprises a 95-grain jacketed hollow point (JHP) which is intended to expand during entry into a threat target. Winchester's trademark petals are larger and thicker than other JHP designs' and facilitate greater weight retention which translates to more momentum being passed into a threat. Buying in bulk with this 500-round case is easier on the wallet and allows shooters to get consistent practice with their ammunition while also testing the relationship between aim and impact for new guns.